Kia ora I would like you to listen to this song and wonder if you like it. I really enjoy this song because it represents Aotearoa (New Zealand) and our people. Hope you enjoy. As the stars covered the night sky Point England school where preparing for their Fiafia. Fiafia is an amazing night where children from the school get to sign up for a group whether its Hip hop, the tongan routine, the samoan routine, and many many more. Yesterday night my group was the amazing Hip hop group. Our tutor was Miss Thompson and also Miss Trimble. Our songs that we dance to was Yeah 3x by Chris brown, Trumpets by Jason Derulo, and last but not least Skrillex New year. My favourite song was obviously New year by the amazing Skrillex. Butterflies rushed through my stomach once I had walked on to the stage but I knew I had to be confident especially for my family that have supported me. As I was dancing I could not help but notice my brother running down the aisle to put money in a box for the school. And that meant my family enjoyed it. At the end of the night I was tired like all the energy had been drained out of me. I would really enjoy doing hip hop again especially after that performance. I really enjoyed this years Fiafia maybe next year it will be even better. 1. Complete a PMI (see the chart below) for using plastic bags, and then one for using paper bags. 5. It doesn't separate until a certain year and time. 1. It makes it way through the soil. 2. a animal could eat it. 3. it affects the environment. 4. birds could get tangled in it. 5. it will cause erosion. 1. that each year that 500 billion to 1 trillion plastic bag are consumed worldwide. 3. that an average american family takes home over 1,500 a year. 4. Americans dispose over 100 billion plastic bags a year. 5. Less than 5% of plastic bags are recycled in the U.S.
2. you can reuse them. 1. they're easy to rip. 4. people litter and sometimes it tends to be a paper bag. 2. Re-read pages 6 & 7. What are other countries doing? Which idea do you think is clever and why? Norway because they make their bags out of potatoes. 3. Do you think New Zealand could do one of these ideas? Which one and why? 4. Make a list of things you can do with a plastic bag to re-use them. Which one do you think we could do here at school? Make them out of potatoes. Do you like agents, secrets weapons and gadgets well this is is a perfect book for you. 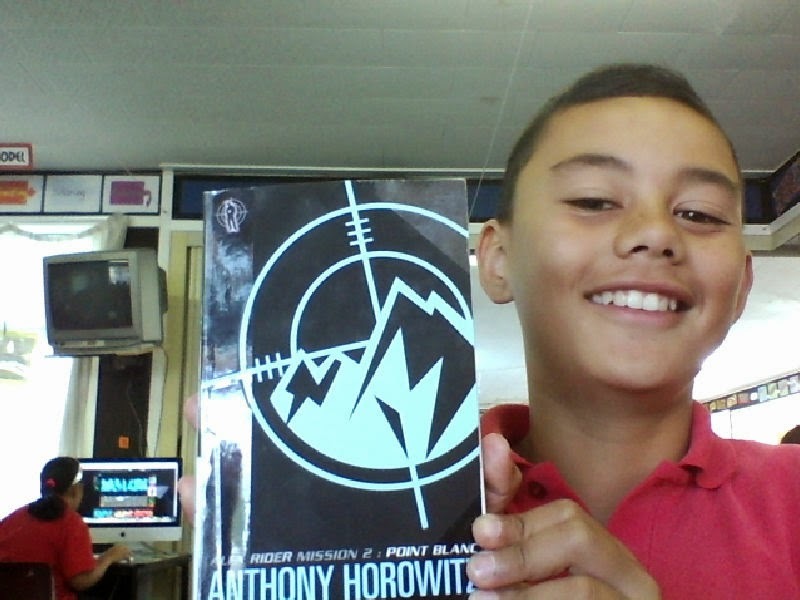 Yesterday I had the opportunity to read on of my favourite books in the entire universe Point blanc by the amazing author Anthony Horowitz. What I really like about this book is the characters the plot and vocabulary. I would rate this book 10 out of 10. This is the best book in the world trust me. I hope you enjoy the book.